"My eyes were made to efface what is ugly." Raoul dufy met Poiret, the fashion designer, in 1909. Poiret encouraged Dufy to start designing pattern for textiles. He set up a small textile printing works, known as "la Petite Usine" ( the small work-shop ) in 1911 and produces Dufy's designs. In 1912 Bianchini Ferier, the famous Lyons silk company, offered Dufy a contract to design silk fabrics for them. Bewteen 1912 and 1928 Dufy designed over two thousand patterns for Bianchini Ferier. Poiret continued to use Dufy's designs for Bianchini in his collections; his summer 1920 collection employed Dufy's fabrics exclusively. 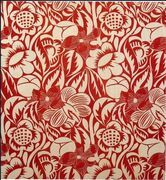 Many of Dufys' designs were monochromatic and in the style of thick lined woodcuts. His most popular work tended towards portraying thick foliage interspersed with birdlife. The style is crisp and graphic so that his designs still look fresh and inviting today. Dufy left Bianchini-Ferier in the late 1920s. He then worked for a while as a designer for the New York company 'House of Onondago'. Dufy, Raoul, "Les tissues imprimés," in Amour de L'Art, No. 1, 1920. Vallotaire, Michel, "New Textiles from France," in Studio, December 1928.